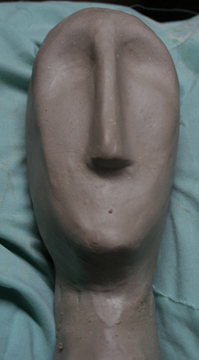 I’ve decided to try and photographically document my progress on sculpting a stylized clay head. It’s not as easy as I thought. Each time I stop to snap a photo I stop the flow of my creative process. 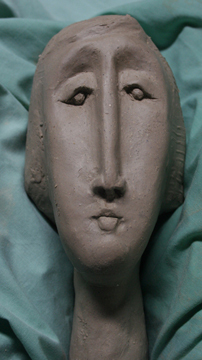 Keeping clay off the camera also slows things down a bit. The photos have provided me with the added benefit of being able to step away from the work and try to view it more objectively. I’m anxious to see how this all influences the end product. I welcome feedback from anyone viewing. This is truly a work in progress. Kind of scary to show something I haven’t completed. Sort of like having someone watching you get dressed in the morning. 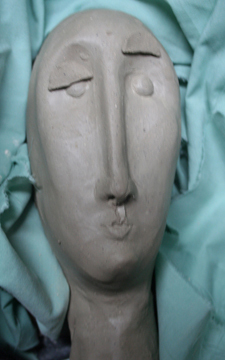 This entry was posted in clay, narrative sculpture, sculpture. Bookmark the permalink. Way cool! Love to see the process. Thanks for checking. Now I need to keep working to finish the piece. I’ll post new photos next week. Barbara, I really like work-in-progress types of blog posts. I’m always interested in the processes artist use to get their results. It was fun to visit your blog and see the types of work you do. Keep it up! Thank you so much for taking time to check things out and give feedback. 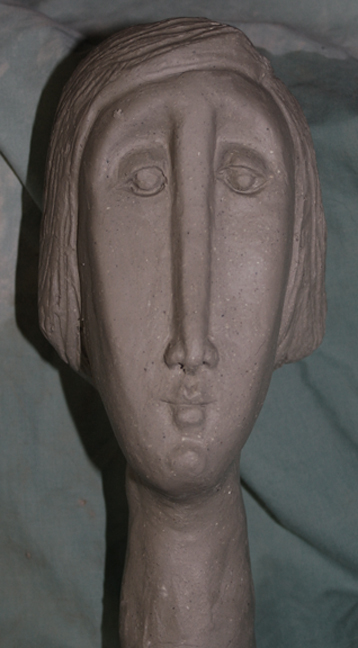 Your blog http://suemartinfineart.com/blog is so well designed and organized in a way that is easy to navigate. I have much to learn. I really love this piece. I am looking forward to seeing the finished piece. 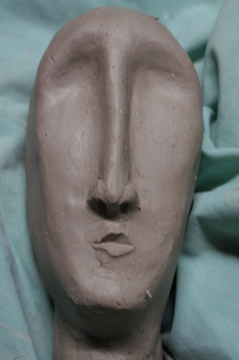 Thanks, it’s in the kiln now for a bisque firing. Hopefully the kiln gods will be kind. I love seeing the progress. I was thinking about ways to keep the camera clean and unobtrusive to your process. So far no solutions but will keep noolding on it. Thanks for posting your blog on Linked In or I would not have found you. Aletta, Thank you for your comment and taking the time to look. I checked out your website. It looks like you have much to offer. I’ll need to review it when I have more time and see where I can benefit.